In an era that is characterized by rapid technological advances, where almost all of our products are plastic or metal and our clothing is synthetic, it may seem like history is slipping away in favor of computer screens, instant updates and iPhone apps. But a dose of centuries-old charm, a respite from the constant barrage of modernity and trendiness, is easily found at Shelbyville’s preeminent antique dealer: The family-owned-and-operated Wakefield-Scearce Galleries. 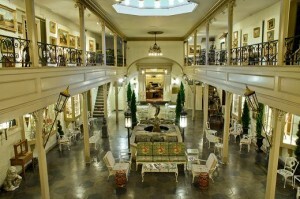 The Wakefield-Scearce Galleries are operated out of Science Hill, a member of the National Register of Historic Places; indeed, a customer seeing the Galleries for the first time might feel as if he is stepping into a Charles Dickens novel. The front entrance greets shoppers with white pillars. The rooms are decorated with finely crafted antique goods. Chandeliers drip light from the ceilings, and in early November of each year, the Wakefield-Scearce Galleries welcome the holiday season with a three-day Christmas Gala, drawing crowds of antique- and history-lovers alike, some from hours away. Founded in 1947 by Mark Wakefield and Mark Scearce, the Wakefield-Scearce Galleries remains in the Scearce family and specializes in fine antique English furniture. It is currently operated by Patrick Burnett, son-in-law of Mark Scearce. 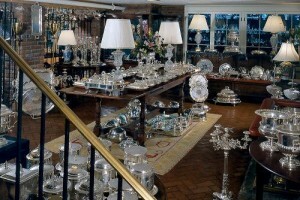 Burnett, who came to operate Wakefield-Scearce about thirty years ago from a background as an industrial engineer, stuck around because of a true love of finding, collecting, and placing beautiful antiques; he speaks of his collection almost reverently. And certainly, these pieces are meant to be enjoyed for generations. Some of them date back to the 1700s and are valued at tens of thousands of dollars. Each of them possessing that “warm and classic” styling that Burnett describes, they’re worth every penny. “I love wooden tea caddies,” says Burnett when asked about his favorite items. “They come in every shape and size and form. They were such a simplistic thing but were in most households. They came up with these little boxes with a lock on them for their tea,” he says, adding a gentle reminder that tea was not always easy to come by. As the person in charge of the day-to-day operations of the galleries, Burnett is the embodiment of Kentucky’s particularly welcoming brand of southern hospitality. “It’s a nice day to come and spend a pleasant day in the country,” he says, inviting me for a visit. “We have a dining room that serves lunch daily, fine Kentucky cuisine. Julia Childs once called it the finest fried chicken lunch in the United States.” That may be the case, but there’s a great deal more to appreciate than the fried chicken.